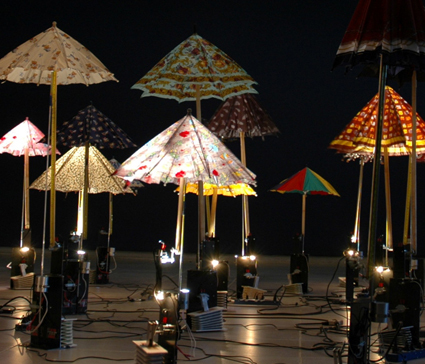 Internationally known visual/kinetic artist, Diane Landry’s presentation of an immersive and an infused sculptural installation with musical components, is comprised of 24 beautifully coloured and computer programmed umbrellas moving as a hybrid of harmonic sound and light. Landry has exhibited worldwide, from Los Angeles to New York, France, Europe, Argentina, Mexico and exhibited in the largest survey of contemporary Canadian art ever produced outside Canada, Oh Canada at Mass MOCA. Join us for a Gala Opening Reception at Definitely Superior Art Gallery Sat.Mar.30 @7-10pm with three new exhibitions. Featuring national / international artists as part of the downtown wide Urban Infill exhibitions and a ferocity of Art, Music, Dance, Wearable Art Performances, catered refreshments and artist talks. Pick up your map and then follow the Tour Guides to all the exciting Urban Infill locations, re-discover your north core through art & culture.